Synonyms - Why do we add escape characters in synonym value and why avoid special characters in synonyms? While creating bot, I have entity with type list of items (lookup). I am unable to recall why this was added. why do we remove special characters from synonym values? Please elaborate your requirement/use-case so that we can provide an appropriate solution. I have one entity node where I have specified it’s type as List of Static values. Is the escape character really required? And we also remove special characters like “#,$,*,! etc” from title and synonyms. Will the bot not work if we add? We have tested the scenario quotes “” and by removing the quotes. There is no functionality difference in the Synonym values. Also, we have tested by having special characters in the Name values. The functionality working as expected. Let us know if you need any clarification on the above. There seems to be some confusion here with double quotes. 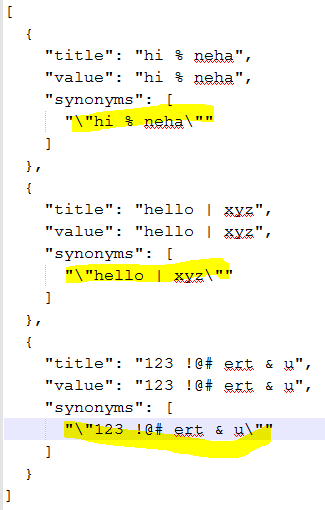 In JSON syntax, strings need to be enclosed in double quotes which is ASCII character 34 (0x22), see http://json.org/. This means that for a double quote to be part of the value then it needs to be escaped by a backslash (there are a handful of other control characters that need to be escaped too, but those are generally not appropriate for NL applications). Any other character is treated as-is. From the samples above then it looks like other characters that look similar to double quotes, but are not ASCII 34, are being used. Unicode has several “double quote” variations and applications (e.g. Word, Outlook) like to use them because they look “nicer”. Those will be handled as that specific Unicode character in the JSON parsing and also in the synonym parsing. Do you mean all special characters are supported by Bot? Please confirm if I got it right? We have checked the special characters as mentioned above. The scenario is working as expected. So we can have any special characters in entity title/synonyms. 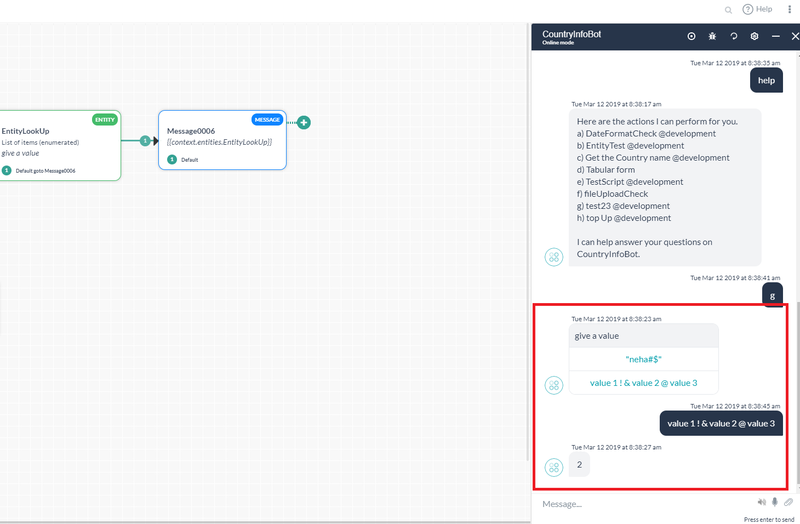 Bot will map the value entered in user utterance correctly and work. There is no exception in special characters we well, right? The challenge with special characters is that they are not a normal part of conversation and people are pretty relaxed in how they use them. In general, characters other than the sentence terminators (period, question mark, exclamation mark) are treated as a word separators and they are parsed to their own individual word. There are exceptions to that of course, for example a percentage symbol after a number, well known currency symbols, hyphenated words. Often people see some symbols as interchangeable, .e.g. forward and backward slash. Other times people might not supply them because they cannot remember how something is formatted, e.g. should that contract reference be partitioned by a slash or a hyphen? 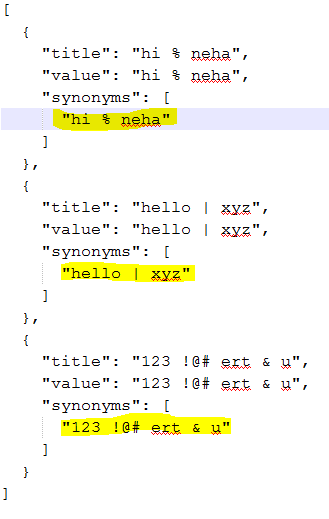 Also note that some symbols are shorthand for words, so standalone “&” is expanded to “and” and “@” to “at”. So I would recommend to be try and be relaxed over special characters if you want to have the greatest success of matching against a wide variety of user input. The system will create several variations of synonyms with and without punctuation to try and be as inclusive as possible.